"I'm like the most specific documentary filmmaker that can be, because I document the way in which I see, which includes my imagination." Watching abstract and experimental films is, let's face it, hard. We're so used to seeing our moving images accompanied by a story�whether a tightly-constructed detective thriller, an expos� of a right-wing politician's hidden agenda, or the attenuated narrative of a music video�that we often forget that movies are about image and movement. (That's why they're called motion pictures.) So it takes a special kind of concentration, one that we rarely call upon, to watch what may be no more than a couple of squiggles moving across the screen. And it often helps to appreciate the squiggles if we know more about what the filmmaker was trying to achieve, and can put the film in its artistic and historical context. Jim Sledden's 1998 documentary Brakhage is an interesting, well-constructed portrait of avant-garde filmmaker Stan Brakhage, who made almost 400 film in the 50 years up to his death in 2003. Along with fellow artists Jonas Mekas and Maya Deren, he's regarded as one of the most important of American experimental filmmakers, and his influence can be seen in everything from music videos to title sequences from such films as Se7en. Starting with the psychodramas so typical of young filmmakers, he eventually moved into more abstract films, even physically manipulating the celluloid itself by gluing things to it or scratching it with a variety of implements. Roughly structured around the chronological presentation of excerpts from 16 of his films, the documentary is both an introduction to Brakhage's principles and work, and a portrait of the man himself. We learn from documentary footage about Brakhage's early realization that typical camera movements don't duplicate how the eye moves, and that he often filmed his family and surroundings as a means to avoid separating his art and his life. Extensive home movie footage gives us more insight into Brakhage's personal life, his two wives and his children, and his working conditions and methods. There are excerpts from several other documentaries on Brakhage (two of them included as extras on the disc), as well as from films featuring Brakhage by underground luminaries George Kuchar and Jonas Mekas. Rounding out the diverse source materials are fairly extensive interview clips from filmmaker and Brakhage collaborator Phil Solomon, as well as a host of other associates and friends. Brakhage has garnered some criticism for its rather sugar-coated portrait of its subject, and it's probably safe to say that it accentuates the positive. We do get brief glimpses of Brakhage's darker side from his wife Jane's description of his sometime eccentric behavior, and his son Neowyn's regret that he rarely got attention from his father other than when he was being filmed. As an accurate reflection of Brakhage the man, Brakhage the documentary may be a bit wanting, but this is a thoughtful, engrossing film, impressive in its variety of source materials, and useful in appreciating those little squiggles moving across the screen. Image Transfer Review: As would be expected of a film that draws on many archival sources, the image quality varies, but most of the newer interviews look good, with strong colors and lots of detail. Some of the older clips, even those presumably shot on film, have 'jaggies' that are a bit distracting. Minor compression artifacts are visible during the rapidly-changing frames of some of the excerpts from Brakhage's films. Audio Transfer Review: Again, the sound varies considerably with the source material, but James Tenney's appropriately atonal score comes through well, with good dynamic range and a reasonable amount of separation. Extras Review: Arnold Gassan and Carlos Steegmiller's Brakhage on Film is a 20m:00s documentary from 1965, presented in full-frame black and white. What starts out as an "Abstract Art for Dummies" quickly progresses into a portrait of Brakhage's day-to-day activities, both with his family and at work. Brakhage expresses his thoughts on film as an investigation into the private world of symbolism, and explains how the Vietnam war was reflected in his art. There are some gaps in the narration, and the primary interest here is the source footage and its intimate glimpse into Brakhage's personal life. The 9m:16s excerpt from Robert Fries and Steve Gebhard's Legendary Epics, Yarns and Fables: Stan Brakhage was recorded in a living room, but the artificial echo added to Brakhage's voice makes it sound more like an aircraft hangar. Brakhage makes brief comments about how objects inspire him and why music is an aesthetic error in film, but he spends most of his time talking about how hard it is to speak extemporaneously to the camera, which quickly grows tedious. An Excerpt Guide allows the viewer to jump directly to each of the film excerpts in the documentary, and a four-page insert with a chapter listing and selected filmography is included. 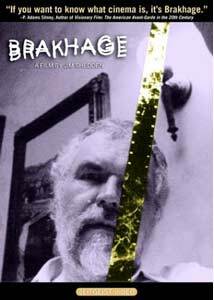 Jim Shedden's Brakhage is an informative documentary about the life and work of legendary filmmaker Stan Brahkage. With the extras, this is an essential disc for anyone interested in the history of avant-garde filmmaking in America.